Birthday Party Piñata Bonanza is a Limited Edition Physical type weapon. This trap is an amalgamation of celebration for MouseHunt's Fourth Birthday! This fun-filled piñata is sure to cause a big bang at the party! Armed with rainbows, party favours, unicorn horns, and even lasers, this purple animal is stuffed with explosive excitement! WARNING: Do not HIT, GRAB, SHAKE, TOUCH, LOOK AT, or THINK LOUDLY ABOUT piñata. 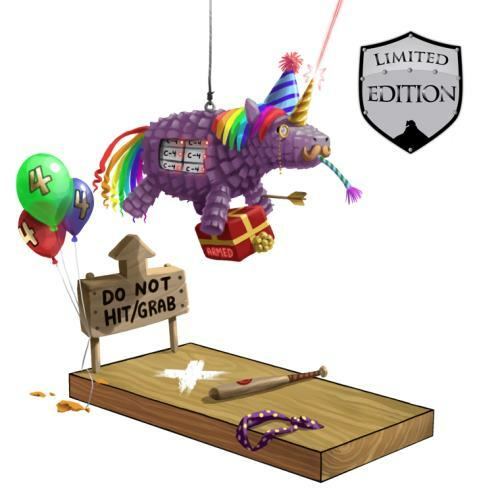 The Birthday Party Piñata Bonanza is a Limited Edition weapon and can no longer be acquired by Hunters. The Birthday Party Piñata Bonanza could be purchased during MouseHunt's Fourth Birthday from the Birthday Party Celebration for 305,000 gold once the hunter obtained 1 Cake Polaroid. The Cake Polaroid was not lost or spent. 24 February 2012: The Birthday Party Piñata Bonanza was painted live during an Art Feedback Friday. Its creation was based entirely on ideas and suggestions provided by the audience at the time of painting. 29 February 2012: The Birthday Party Piñata Bonanza was released with the beginning of MouseHunt's Fourth Birthday, although it could not be purchased until hunters had obtained a Cake Polaroid. The use of "HIT/GRAB" in the description and artwork is a reference to HitGrab Inc.